This is a residence designed for a brother and sister. The area of the site measures approximately 70 m2, and the total floor space, 80 m2. In this project, the client wanted a habitat that would enable the siblings to lead separate lives on weekdays and together as a family on weekends. Thus, the plan includes two bedrooms and two main rooms. The first floor is for the sister and the second floor for the brother. On weekdays, House HH functions as a residence for two family units with each sibling staying in their own main room and bedroom on each floor. Though the rooms are by no means large due to the limited area of the site, ample storage capacity and varied nuance of the ceilings contribute in giving the rooms a rich, pleasant and warm atmosphere. The second floor corridor has large top lights and the floor is created with fiberglass reinforced plastic grating, allowing light to filter through to the first floor. This makes it possible for people on the first floor to feel the presence of people on the second floor, and vice versa. The first floor corridor, which is filled with light, is paved with concrete tiles that continue onto the front road. In other words, the corridor has been designed as an outer space, serving as a buffer area to separate the brother and sister on weekdays, and functioning as a light garden to bring the two together as a family on weekends. House HH can switch modes between weekdays and weekends by taking the action of seeking light, that is to say, by opening the sliding door next to the stairs, on the corridor. This joins the two main rooms on each floor together through the stairs and the light garden beyond, resulting in one large main room filled with light − a space for the residents as a family. The sliding door also serves to divide the first floor area into two, creating a smaller room with privacy. On weekends and holidays, the layout takes on the appearance of one main room and two bedrooms for one family. Thus, House HH was completed as a house for a brother and sister, as a house that can switch lifestyles and family units between weekdays and weekends. I believe that this is another solution for urban families as they become more varied and complex. P.S. 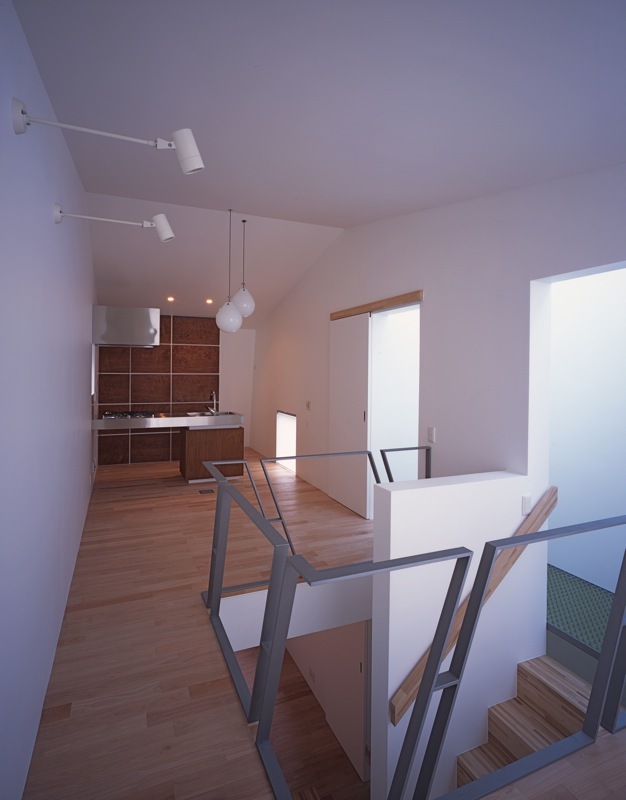 I would also like to add that House HH managed to achieve an extremely low construction cost (including the demolition cost of the old house) of under 20 million yen. * residence for an "urban" extended family: a house that accommodates the needs of modern nuclear families who have grown accustomed to independent life but have chosen to enjoy the benefits of being part of a large family.